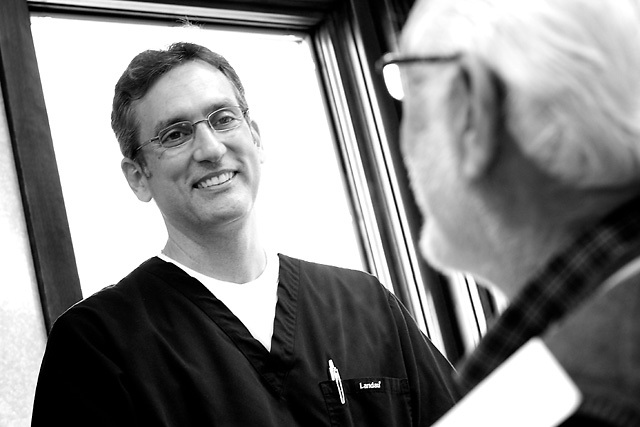 Dr. Bill Schlosser has served individuals and families in the Springfield area for more than 20 years. Over that time, he has honed his skills in the areas of restorative dentistry, cosmetics and implant dentistry. He is a strong believer in the value of teaching patients to prevent decay and preserve their smiles as one of their most valuable attributes. He believes a healthy mouth is key to overall good health, and understands how problems in the mouth contribute to problems in other parts of the body. Although he takes great pride in the technology used in his office, his priority is focusing on each patient’s unique goals and providing a personal touch in helping them reach optimal dental health. Dr. Bill Schlosser is currently an Adjunct Professor with SIU School of Medicine. He is involved in developing a teaching model for medical schools on the Oral-Medical Health Connection and helping medical students become more comfortable with oral exams. When he isn't wearing scrubs and seeing patients, Dr. Bill Schlosser is busy raising sons, Jacob (SLU LAW) and Noah (Greenville University), with his wife (Visionary, Consultant, Diabetes Advocate and More), Lori. Exercising and giving up improving his golf score fall just behind enjoying the constant laughter his family provides.